Tactical Walls Concealment Coffee Table houses home-defense guns, including AR-15s, shotguns, and handguns. An RFID-activated shelf drops down, providing quick access to the home owner. People are concerned about their safety—more so today than ever before. More people are obtaining concealed carry permits and are legally carrying concealed. Some are concerned about access to their self-defense firearms while in the home. Here are a dozen or so innovative ways to keep your firearms out of sight but close at hand. Carrying a personal-defense handgun in a holster attached to a belt or in a pocket holster is preferable because regardless of what you are doing or where you go, it will always be with you and quickly accessible. Off-body concealment is not as good because a gun can be more easily snatched than when it’s attached to the body, and there is always the possibility of absentmindedly walking off and leaving it behind in a public place. Even so, it is the only alternative for some who choose to carry a handgun for personal protection. I most often use a belt or pocket holster, but circumstances require me to carry off-body several times each week. And for that my Galco Defense Planner looks like any other leather-covered day-planner on the outside. Empty weight is 9.8 ounces, and when closed, it measures 8.5 inches long, 6 inches wide, and 2.5 inches thick. Unzipped it reveals two elasticized holders, one for a Glock 19, the other for a spare loaded magazine. My practiced tactical plan is to drop the planner once the gun is drawn, and for that reason, the extra magazine goes in my pocket. Granted, it is not the best way to carry spare ammunition, but at least it stays with me if the Defense Planner is left behind. All violent confrontations do not require deadly force, so a small holder inside the Defensive Planner is for a canister of pepper spray. A day-planner designed for concealed handgun carry is also available from Blackhawk. 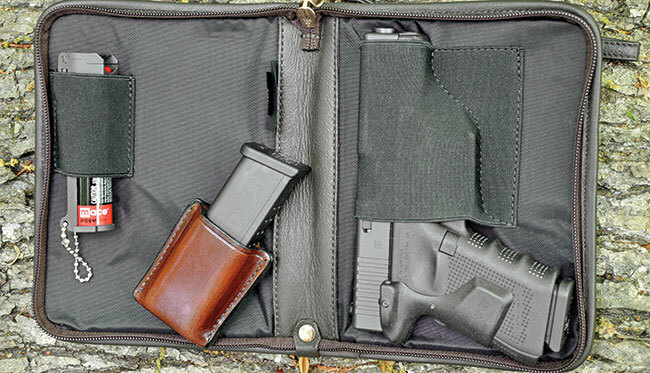 When carrying a handgun in a holster is not possible, Layne relies on a Galco Defense Planner. He usually carries a spare loaded magazine in a pants pocket. Ladies’ handbags designed specifically for concealed carry have several compartments, one of which is designed for easy access to a handgun. One used by my wife is made by Galco, and it is called the Del. Made of full-grain leather with solid brass hardware, the Del comes in black, brown, or tan. Shoulder-drop adjustable from 16 to 20 inches, the carry strap is a comfortable 1.5 inches wide. Exterior dimensions are 10 inches tall, 11 inches wide, and 4.25 inches deep. It weighs 28 ounces and has internal compartments for personal items as well as a pocket on the outside that’s perfect for a magazine or a newspaper. The tops of two larger interior compartments are closed off by a heavy-duty brass zipper. Each of those contains a couple of smaller pockets (one zippered, the other open-top) for items such as car keys, lipstick, sunglasses, and pepper spray. A third large compartment with a zippered opening at one end of the handbag contains a holster. The maximum handgun length it will accept is around 7 inches, perfect for a Colt Officer’s ACP or Glock 19 or smaller guns like the Ruger LCP. And for the benefit of women who have young children in the house, the zipper slider of the gun compartment is lockable with a pair of included keys. The Del offers the same tactical advantage as a pocket holster—the hand can be discreetly grasping the gun while it remains concealed by the purse. Among several advantages offered by Galco’s Del handbag is the option of gripping a handgun while it is still concealed. Hiding handguns in plain sight in the home is also popular with small, lockable safes often used by families with small children. Excellent examples are those available from Hornady. The Rapid Safe 2700 I have is roomy enough for a full-size Model 1911, while the 2600 version handles most guns with 4-inch and shorter barrels. Both exceed ASTMI safety standards for child and pry resistance, lock strength, drop/pick/saw tests, and hinge attack resistance. And for those who travel, the safes also meet TSA requirements for handgun safety in checked luggage. Operating on both AC and battery power, they are designed for touch-free entry and can be opened by radio frequency identification (RFID) wristband, key fob, or sticker. When activated, the lid springs open for easy access to the gun. For those who might feel uneasy about dependency on electrical power, both safes can also be opened manually with a supplied key. Empty weight of the RS 2700 is 8.75 pounds. Hornady’s Rapid Safe 2700 operates on AC and battery power and offers touch-free RFID access. It can also be opened with a supplied key. A common strategy is to hide a handgun and ammunition in each of several rooms in the house, with the side of the bed said to be one of the more popular. Some bedside mounts require a separate holster, but the one from Blackhawk has a built-in holster designed to handle any handgun, ranging in size from the S&W J-Frame revolver to a full-size Model 1911. 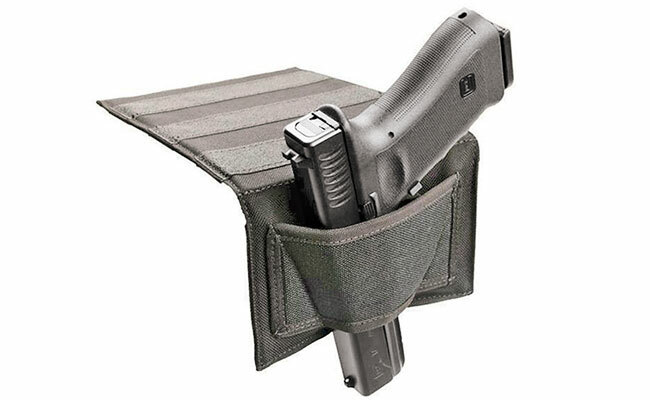 The holster is of Cordura nylon construction, and its flap has a nonslip coating to prevent it from slipping out from between the mattress and box spring. The handgun is held in a vertical position, and ambidextrous design allows it to be attached on either side of the bed. Like all holsters of its type, it is concealed when the bed is made. The nonslip flap of this bedside holster from Blackhawk fits between the mattress and the box springs. The ambidextrous design allows it to be used on either side of the bed. Don’t Tread on Me (DTOM) offers an ambidextrous bedside holster, and it has loops for a small flashlight and extra magazine. The company also offers a rig that holds a handgun flat against the underside of a desk or table. Commonly described as under desk holsters, they are available from several other companies as well, including By My Side and Wolverine. A kit from Concealed Carrier LLC includes strong magnets that hold a gun and a spare magazine under a desk, beneath the dashboard of an automobile, or in many other locations. A protective coating on the magnet prevents wear on the finish of the gun. An Internet search will turn up holsters from DeSantis and others that are intended for mounting in various locations inside an automobile, but before trying one, make sure its use is legal in your area. This holster from Don’t Tread on Me attaches to the underside of a desk or table, keeping the handgun out of sight but at the ready. “Have an issue? Grab a tissue!” That from Tactical Walls on the company’s handgun-concealable decorative tissue box that looks both innocent and natural when placed on a coffee table, dressing table, or anywhere else in the home. When the upper section of the Issue Box containing a box of tissues is lifted, a foam pad in its base is exposed. A sharp knife is used to cut out a cavity in the foam for a medium-size handgun or for a small handgun and spare magazine. The gun is accessed by removing the upper section from the base. Double-sided tape (not included) is recommended for securing the box of tissues to the upper section. Extra boxes of tissues sized to fit the box are available from Tactical Walls. When it comes to hiding guns in the home in plain sight, the folks at Tactical Walls keep busy exercising their imaginations. One of the more interesting ideas is an easily mounted faux wall clock made of plastic with a supporting capacity of 10 pounds. Velcro holds the face of the clock against a hollow base where magnets hold a couple of handguns in place. Accessing them is as quick and easy as ripping off the face. Tactical Walls offers several clever ways to hide your personal defense guns in plain sight, including tissue boxes, wall clocks, shelves, and coffee tables. And then we have the Tactical Table Lamp from Tactical Walls. Removing its front cover accesses a handgun and a spare magazine held in place by magnets. 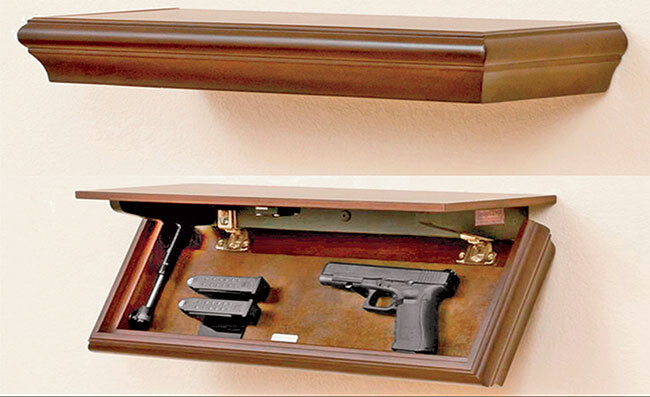 If that’s not enough, place the lamp on a walnut Nightwatch End Table from AZ Concealment. Positioned on both sides of its main drawer are two narrow drawers. One is locked with a key and holds spare ammo and other items. The other is spring-loaded, and when RFID activated, it pops out to present a handgun in a quick-draw position. 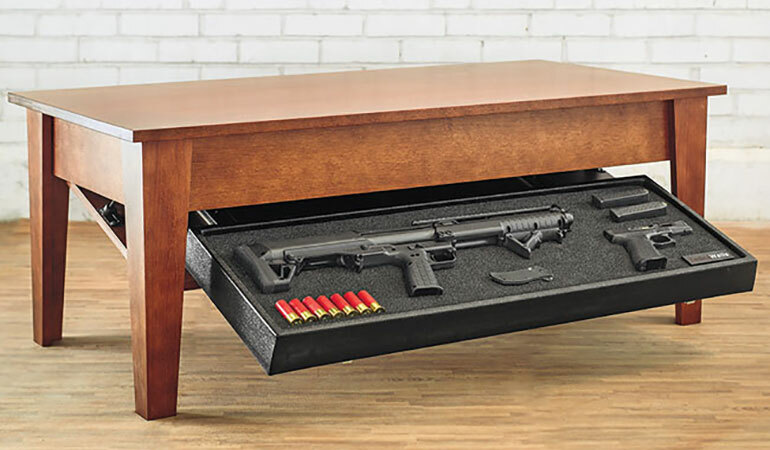 Tactical Walls and a company called New Jersey Concealment Furniture offer coffee tables that house home-defense guns, including AR-15s, shotguns, and handguns. Models vary, but generally an RFID-activated shelf drops down, providing quick access to the home owner. New Jersey Concealment Furniture, Tactical Walls, and Fort Knox offer wall-attached shelves of various lengths with most of them long enough and thick enough to conceal a rifle or shotgun along with a handgun. With various common household items placed on top, it appears to be just another shelf, but when the latches are magnetically activated, a full-length bottom compartment hinges downward to allow access to the contents. New Jersey Concealment Furniture, Tactical Walls, and Fort Knox offer wall-attached shelves of various lengths with most of them long enough and thick enough to conceal a rifle or shotgun along with a handgun. While these and other items come ready to use in the event of a home invasion, keep in mind that the items I have included are intended for concealment and reasonably quick access. If you are lucky, they might be overlooked by a burglar, but they are not intended for theft prevention. Also keep in mind that some are not suitable for use in homes with children who are too young to be taught firearms safety.